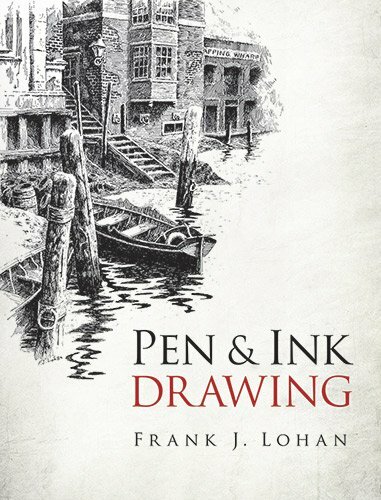 I've reviewed Frank Lohan's earlier book on pen and ink drawing called Pen and Ink Techniques. This book is less technical than that book. The illustrated examples are typical pen and ink perennial favourites such as barns, bridges, farms, wooden houses, countryside, waterside, plants, animals and trees. Frank Lohan would talk about the subjects he draws, such as places he visits and sights that catch his attention. It's followed by an explanation of how he drew, the techniques and approach he used which are fairly helpful to know. As I've said, it's not a very technical book. It's a book where you learn by copying what you see. For example, there are many illustrated examples on different kinds of hatching. For shadowed areas, it says to go over the area to make it darker but there's no elaborate instruction on how you layer the lines, choosing the angle of the lines, distance between the lines. This is sort of a supplement book on whatever pen and ink drawing techniques you've already known. If you're a beginner, you should probably go for more hands-on books like Pen and Ink Techniques or the more comprehensive Rendering in Pen and Ink.